At 68, Amitabh Bachchan has done all kinds of films, be it comedy, action, masala, or parallel cinema. Now it’s Big B’s turn to go Hollywood. The actor will reportedly make his Hollywood debut with Baz Luhrmann's film The Great Gatsby, which also stars Leonardo DiCaprio. 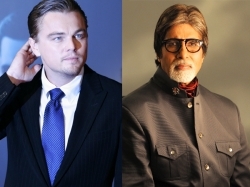 Amitabh Bachchan is the latest to join the ensemble cast of the romantic drama The Great Gatsby, along with the Scottish-Australian actress Isla Fisher, the ‘Spiderman’ star Tobey Maguire, Joel Edgerton and the young British actress Carey Mulligan. So, what is Amitabh Bachchan doing in the film? He will play the role of Meyer Wolfsheim, says an official statement from Warner Bros Pictures. The Great Gatsby is a 3D adaptation of the classic F. Scott Fitzgerald novel of the same name to be made on a budget of $125 million. Luhrmann, who has made magnum opus Moulin Rouge, is eager to start the film with the cast soon. The principal photography of the movie began this week in Sydney. Luhrmann is also happy to shoot in Australia. The movie will be distributed in 3D as well as in 2D by Warner Bros Pictures and in certain territories by Village Roadshow Pictures.